“There will be no global warming. 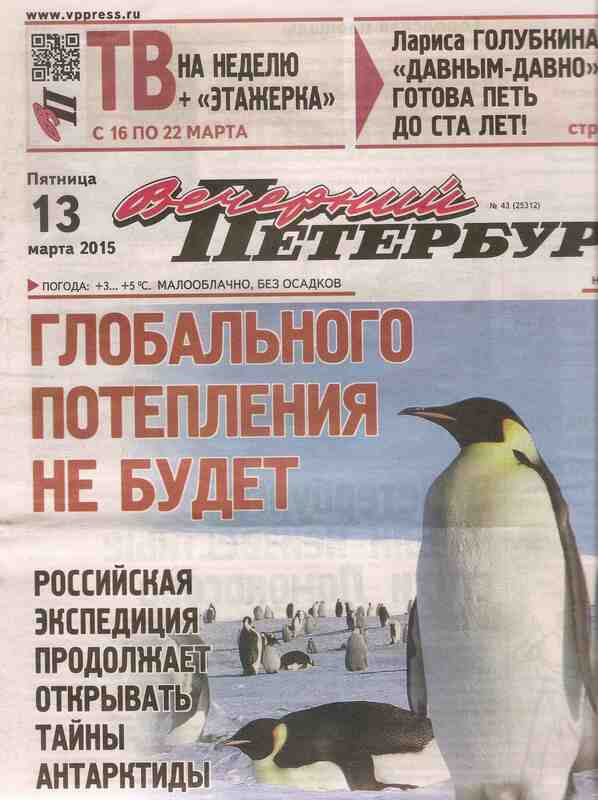 Russian expedition continues to uncover the secrets of Antarctica.” Front page of the March 13, 2015, edition of Vechernyi Petersburg newspaper. To many climate scientists, the worsening fires are a consequence of Siberia getting hotter, the carbon unleashed from its burning forests and tundra only adding to man-made fossil fuel emissions. Siberia’s wildfire season has lengthened in recent years and the 2015 blazes were among the biggest yet, caking the lake, the “Pearl of Siberia”, in ash and scorching the surrounding permafrost. But the Russian public heard little mention of climate change, because media coverage across state-controlled television stations and print media all but ignored it. On national TV, the villains were locals who routinely but carelessly burn off tall grasses every year, and the sometimes incompetent crews struggling to put the fires out. While Western media have examined the role of rising temperatures and drought in this year’s record wildfires in North America, Russian media continue to pay little attention to an issue that animates so much of the world. The indifference reflects widespread public doubt that human activities play a significant role in global warming, a tone set by President Vladimir Putin, who has offered only vague and modest pledges of emissions cuts ahead of December’s U.N. climate summit in Paris. Russia’s official view appears to have changed little since 2003, when Putin told an international climate conference that warmer temperatures would mean Russians “spend less on fur coats” while “agricultural specialists say our grain production will increase, and thank God for that”. This reminded me of a dismal interview I had read this past spring in Vechernyi Petersburg, a now-defunct local rag. (The front page of that particular issue of “Vechorka” is depicted at the top of this post.) I had thought about translating it at the time, but since I prefer to push stories that, however bleak, have a positive hook (meaning they feature an underdog or underdogs fighting the powers that be, whatever the odds), I thought better of it. Now, however, that the official line seems to be run the country into the dirt as quickly as possible, I am kicking out the jams (at least, tonight). After all, somebody out there might be wondering why a country that should have everything going for it in terms of human and natural resources is trying so hard to become a failed state. Interviews like the one that follows—with a gentleman not only purporting to be a scientist, but a scientist charged with running the Russian Antarctic Expedition—might give you a clue. The summer season of the Sixtieth Antarctic Expedition is coming to an end. The scientific research vessel Akademik Fyodorov is now making the rounds of the stations, supplying them with food, fuel, and materials for the coming eight or nine months. In early March, the ship left Progress Station. Its next stops are Molodyozhnaya Station, Novolazarevskaya Station, and Bellingshausen Station. In April, the Akademik Fyodorov will sail for the shores of South America, and on May 15, it will return to Petersburg. In anticipation of the completion of the latest stage of work, Vechernyi Peterburg met with Valery Lukin, head of the Russian Antarctic Expedition (RAE). Valery Vladimirovich, what are the results of the 2014–2015 season? I must say right off the bat that employees of thirty-one organizations, representing ten federal agenices, are involved in the RAE. They include Roshydromet, Rosrybolovstvo (Federal Agency for Fishery), Roscosmos (Russian Federal Space Agency), Rosatom, the Ministry of Defense, and so. Work is underway on sixty-four projects, and each of them is significant. Nevertheless, I would note the drilling of a second borehole into the subglacial Lake Vostok and laying the foundations for installing new ground-based monitoring equipment for the GLONASS satellite navigation system. Interesting work has been done in the oasis of dry valleys,near the American McMurdo Station on the shore of the Ross Sea. They contain the most ancient varieties of permafrost on earth, thirty to forty million years old. Such polar caps exist in similar conditions on Mars. This gives us a unique opportunity for developing the technology to sample this material in the future. I should also note that the Russian Federal Ministry of Culture has implemented several of its own projects in Antarctica for the first time. One of them is the creation of the latest (the third) in a series of virtual branches of the Russian Museum for RAE personnel. The first was unveiled on board the Akademik Fyodorov; the second, at Novolazarevskaya Station; the latest, at Bellingshausen Station. One of the priorities in Antarctica is the study of climate change. Why is it important? And how do things stand with global warming? Indeed, it is extremely important. After all, what is the ice of Antarctica? It is compacted precipitation. By carrying out isotopic studies on it, we can track changes in temperature on earth, as well as the levels of methane and carbon dioxide that were in the atmosphere many years ago. Based on the research done on the ice core at Vostok Station, we have assembled a picture of climate change over the last 420,000 years. This included four complete climatic cycles: glaciation and warming with an average period of 100,00 years. We are now in an interglacial period, between peaks of cooling. But it is unclear how long this period will continue and whether it has reached its maximum. No one knows where we are headed. As for global warming, in my opinion, it is only a topic for speculation that is advantageous to businessmen, politicians, and journalists, and which bears no relation to reality. But what about the movement of glaciers, which are, allegedly, melting furiously? Glaciers are always moving. Near the Geographic South Pole, at Amundsen-Scott South Pole Station, they move at a speed of 11.5 meters a year. Near Vostok Station, they move at a speed of two meters a year. This is ordinary aerography: new ice forms, old ice flows. Now if it stopped moving, that would be something worthy of immediate attention. In the 1960s, Sovet scientists and their colleagues from Dresden took measurements of the glacier on a 100-kilometer segment of the track from Mirny Station to Vostok Station. Forty-four years later, the measurements were repeated. The ice had grown by forty-two meters! What melting are we talking about here?! As for speculation around a topic, let me remind you that, twenty years ago, all the media suddenly wrote about the growing hole in the ozone layer over Antarctica and the catastrophe it threatened. It was the owner of the large chemical company DuPont who had raised the issue. It was he who paid scientists to study the phenomenon. The scientists concluded that the reduction of the ozone layer had to do with Freon entering the upper atmosphere. Ultimately, this substance was banned. But Mr. DuPont created a new substance, Freon-141, which, by the way, is two and a half times more expensive than the “old” Freon. The problem of the hole in the ozone layer did not go away. But it has been forgotten: people with a stake in the matter performed the task assigned to them. The same thing is sure to happen with the topic of global warming. Antarctica is an icy, barren continent. What is the practical benefit of researching it? National security. The economic effects. Strengthening international prestige. With regard to safety, we are talking about ground support in the Southern Hemisphere for our space program. In Soviet times, this problem was solved by a special space fleet. A whole series of craft was built. Then they were scrapped. Using radar stations located in southern Russian, we can look into near-Earth space no farther than thirty degrees latitude south. If we talk about the economic effect, we could talk about developing fisheries in the Southern Ocean. One of the most valuable commercial fish in the world, the Patagonian toothfish, is found in these waters. It dwells at a depth of 600 to 1,200 meters, grows to a length of two meters, and weighs up 160 kilograms. The cost of one kilogram of this fish on the wholesale markets is sixty dollars. It is selling like hot cakes in Japan, South Korea, Hong Kong, and the US. From the 1960s to the 1980s, we were the leaders in catching it. In the 1990s, we virtually abandoned this field. The challenge now is to return. Finally, estimating the mineral reserves [in Antarctica] is an important taks. Our country’s economy is resource dependent. And if we do not keep up with the prospects of mining on earth, we have a lot to lose. We have to have our finger on the pulse. The media periodically reports incredible events that are observed on the sixth continent. Either people disappear with enviable regularity or strange magnetic phenomena occur. What can you say about this? These UFO publications cannot be taken seriously, of course. People have definitely not disappeared. Although there are a lot of mysteries. And we are going to encounter them again and again. Subglacial lakes, for example, were discovered a mere twenty years ago, and by chance. We were able to identify Lake Vostok due to a combination of seismic research, radar observations, and satellite measurements. It turned out that in the vicinity of Vostok Station the ice sheet was fairly smooth. There were hills all around, but here there was a flat slab, 250 kilometers long, 70 kilometers wide. Where does that happen? That is right: only on the water. Valery Vladimorovich, many scientific programs are now feeling the pinch due to the difficult economic situation in the country. How has this affected the RAE? Budget cuts to the expedition this year will amount to 10%. However, given the need to use foreign aircraft, sail into foreign ports, and pay with foreign currency, the real reduction in the budget will be 35%. Unfortunately, certain programs will have to be wound down. For example, we are planning no research and drilling work at Vostok Station. It is just too expensive. Boring into the subglacial lake and collecting water from it, something we have been so looking forward to doing, is not going to happen next season. In most other areas, research will continue. Valery Lukin, as it turned out, was much too sanguine about the effect of budget cuts on the RAE. Russia’s state-funded Antarctic expedition has had to halt its research due to a lack of funding, the TASS news agency reported Wednesday, citing one of the scientists involved in the expedition. “It’s not yet clear how long the research will be suspended for,” Ruslan Kolunin told TASS. He said that work on drilling a borehole in the ancient Lake Vostok has also been suspended. “The borehole is frozen at the moment, no work is under way there right now,” he was cited as saying. The only research being carried out in the Antarctic as part of the expedition this year is a meteorite project by the Ural Federal University, Kolunin said. “That is financed by sponsors and the university, though,” he added. Earlier this year, the expedition’s head Valery Lukin said that scientists wouldn’t be able to continue researching Lake Vostok during the next season, which lasts from December 2015 to February 2016, due to decreased funding, TASS reported. The expedition, Lukin said, is financed directly from the federal budget. In 2015 it was allocated 1.18 billion rubles ($18 million), but in 2016 that will decrease to 1.061 billion rubles ($16 million), which he said was not enough to continue work at the lake. Lake Vostok lies buried beneath a 3,769-meter layer of ice. Locating it and accessing its relict waters is considered one of the main discoveries of the expedition so far, the report said.